/ APEC RO-90 Water Filter Review: Is It Right for You? There are several different methods of filtering water to consider. Most of them make the water taste better, but not all of them remove harmful contaminants. Reverse osmosis is one of the most effective ways to purify water so that it tastes good and it's safe to drink. 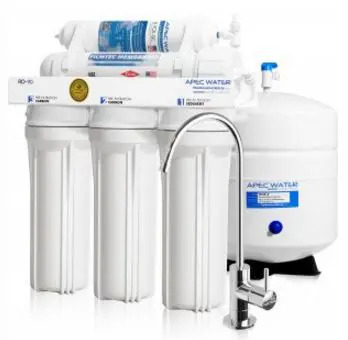 The APEC RO-90 is a top-selling reverse osmosis water filter for home use. It has a lot of great things going for it, but it's not for everybody. In this review, I'm going to tell you how it works and how effective it is. By the end, I hope you'll have enough information to decide if this is the right filter for you. Don't have time to read the whole review? Just want to know how much it costs? You can click here to check the current price of the APEC RO-90 at Amazon. You can click on one of the questions below, or scroll down to read the whole review. How does the APEC RO-90 reverse osmosis system work? What does it remove from the water? Does it work as a fluoride water filter? Is the APEC RO-90 WQA certified? What comes with the APEC RO-90 system? Can I install an APEC water filter myself? How much room does it take up under the sink? Are all parts BPA free? Can I hook it up to my refrigerator? Who should not buy an RO-90? Where's the best place to buy the APEC RO-90? Do APEC water filters come with a warranty? The RO-90 connects to the cold water plumbing in your house. Water pressure pushes the water through the filter system and out the faucet. The water goes through a sediment filter to get rid of dust, dirt, and rust. Next the water enters a carbon block filter. This takes out chlorine, bad tastes and smells, and chemicals. A second carbon block filter removes anything that the first carbon filter missed. Then the water goes through a reverse osmosis membrane. This eliminates contaminants like lead, fluoride, viruses, and bacteria. Waste water empties into the sink's drain. The purified water goes into a pressurized holding tank. The water leaves the holding tank and goes through one last refining carbon filter on its way to the faucet. This final step takes away any taste it might have picked up in the tank. Arsenic, lead, fluoride, chlorine, chromium, and radium, and more. Yes. Reverse osmosis is one of the few types of filters that will remove fluoride from water. Yes. The RO-90 was tested and certified by the Water Quality Association (WQA), and it meets NSF/ANSI 58 standards. So you can trust that it really is making your water safe to drink. That depends on a couple of factors. If the water pressure is 50 psi and if the input water temperature is 77 degrees F, it will produce 3.1 gallons of purified water per hour. That's 72 gallons per day. With water pressure of 60 psi, it can produce up to 90 gallons per day. That's why this model is named "RO-90". Most people on municipal water have adequate water pressure. It's more likely to be a problem if you're on a well. Lower water pressure and lower temperatures will slow down the flow rate. Fortunately, that means that when it's hot outside and you're using more water, you're going to have a steady supply. For every 1 gallon of filtered water, 3 gallons go down the drain. This is one of the few things that I don't like about reverse osmosis filters. That seems like an awful lot of waste to me, especially if you're in a drought-prone area. But, some resourceful people collect it and use it for the garden or pool, or for cleaning. Also, consider that this only includes your drinking water. It's actually only a small portion of the total water you use in your home. 5 feet of food grade tubing. Versatile 1/2” to 3/8” feed water adapters. High quality lead-free chrome faucet. Yes. The system comes with step by step instructions so you can install it yourself. That means you can skip the plumber and save yourself some money. Many reviews I've read say that it's easy to do and only takes an hour or two. The biggest challenge seems to be working in the tight space under the kitchen sink. Several reviews also mentioned that APEC customer service was very helpful if they needed help. The system dimensions are 15"w x 7"d x 18"h and the water storage tank dimensions are 11" dia x 15"h. It should fit in the cabinet under most kitchen sinks. If the height of the tank is a problem, you can lay it down on its side. If you have a basement with an unfinished ceiling directly under your kitchen sink, you could install it there and run the tubing up to the sink. Doing this would save some of that precious space in your sink cabinet. Yes. The filters, plastic fittings, tubings, and housings are NSF Certified and are BPA free. They're made in the U.S., too. I know that's important to a lot of people. Yes, you can hook up your refrigerator for great tasting ice cubes and cold drinking water. You'll need to buy a special kit, but it's less than $15. It may be a bit tricky, though, if your fridge is on a different wall from your sink. The manufacturer recommends replacing the Stage 1, 2 and 3 pre-filters every 12 months. The Stage 4 membrane and the Stage 5 post-filter should be replaced every 3-5 years. The life of the filters depends on your water quality and usage. The harder the filters have to work, the faster they will wear out. The only way to know for sure if they need to be replaced it to test the water with a TDS meter. you have low water pressure (30-50 psi). If that's the case, you might consider a different APEC water filter system like the RO-PERM. It has an extra pump to make up for lower pressure. you want a portable filter. you want a filter for emergency situations where there is no water coming into the house. I recommend shopping at Amazon. Because the prices at Amazon can change at a moment's notice, I don't include them in my reviews. But, you can check the current price at Amazon by clicking here. The manufacturer sometimes has sales that offer a slight discount. However, there is a charge for shipping, and it's not cheap. Yes. APEC systems come with a 1 year manufacturer's warranty. I'm very impressed with this filter system. The fact that it's WQA certified assures me that it does what the manufacturer claims it does. And the 1 year warranty is also a big plus. If I were in the market for an under sink reverse osmosis water filter, I would definitely consider this one. There are other models of APEC filters to choose from. If you have issues like low water pressure or a need for portability, there's a solution for you. Read my review of 4 popular APEC systems here. If you think that the RO-90 water filter will meet your needs, head over to Amazon to check the price and availability.